Strong houses are made of concrete, lumber, and shingles, but a strong home is much more—it’s a place for family, for coming together, and for building the foundations of a healthy life. For many families in Otsego County, however, home ownership is a dream out of reach. As part of the student program, Habitat for Humanity’s 25th home build began at the beginning of the school year in Kirtland Community College’s parking lot. The Otsego County Habitat for Humanity (OCHFH) has served its community for 25 years, striving to bring people together to build homes, communities, and hope. Now building its 25th home, OCHFH is bringing together more community members than ever through a partnership with Kirtland Community College (KCC). Beginning in September 2018, KCC developed the program out of a need which blossomed into a truly unique educational and philanthropic opportunity for six area high school seniors. These students have been hard at work building the home with a goal to complete the project in the summer of 2019. 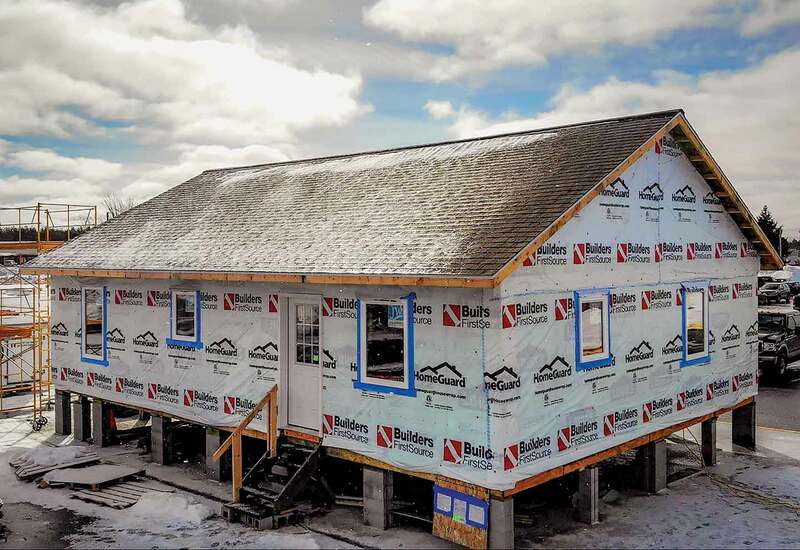 Upon completion, the students will have earned 14 college credits, a 10-hour OSHA industry certification, valuable experience, and the opportunity to play a role in providing one Otsego County family a home. “We wanted a way for area high school students to get an experience doing something for their community, as well as have the opportunity to earn some college credits,” said Steven Fosgard, dean of occupational programs at Kirtland Community College. In addition to helping families, the students are taking part in a project that will positively impact the environment for years to come. 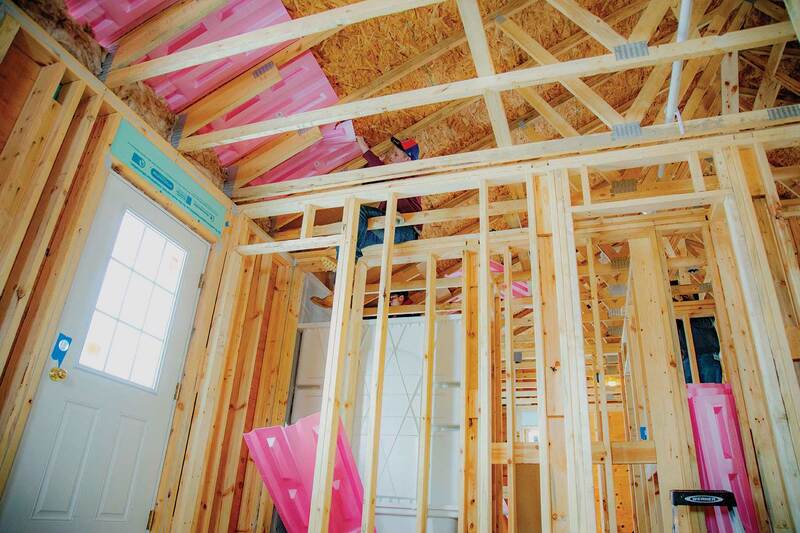 All Habitat for Humanity homes are built to be as energy efficient as possible, utilizing Energy Star-rated products with special energy efficiency consideration for the foundation, lighting, windows, HVAC, insulation, furnace, and water heater. The home, currently being entirely constructed on KCC grounds, will be even more environmentally friendly when it is relocated to its permanent destination later this year. Like many of the families OCHFH assists, the new home’s occupants will also be served by Great Lakes Energy. Through power supplier, Wolverine Power Cooperative, more than half the energy Great Lakes Energy provides its members is carbon free. 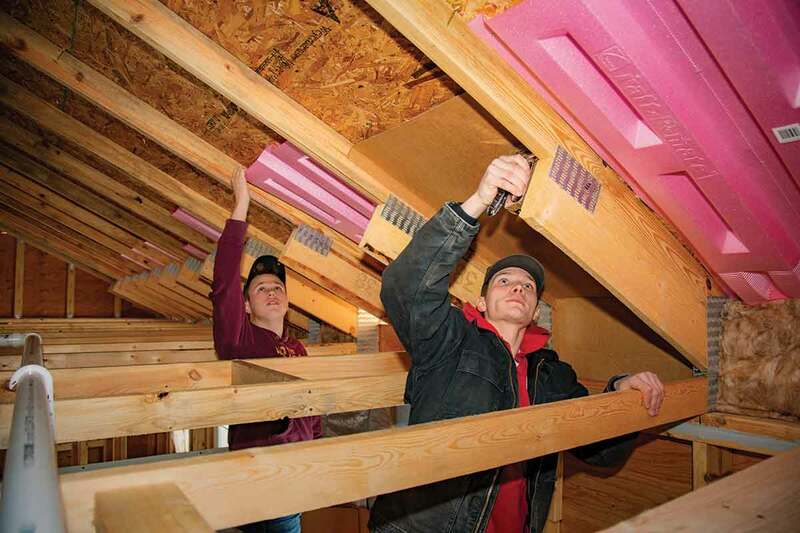 Allen Morgan and Ayden Lauer from Johannesburg High School place venting insulation. Home builds are an important part of Otsego County Habitat for Humanity’s mission, but they provide many other services to the community as well. To achieve this goal, OCHFH has expanded their programming beyond home building with the help of community partners like Great Lakes Energy. Through GLE’s People Fund grant program, programs like financial coaching, weatherization, critical home repair assistance, disaster relief assistance are offered. Funds donated through the People Fund also helped create the Habitat Learning Garden to help teach home and yard maintenance skills. 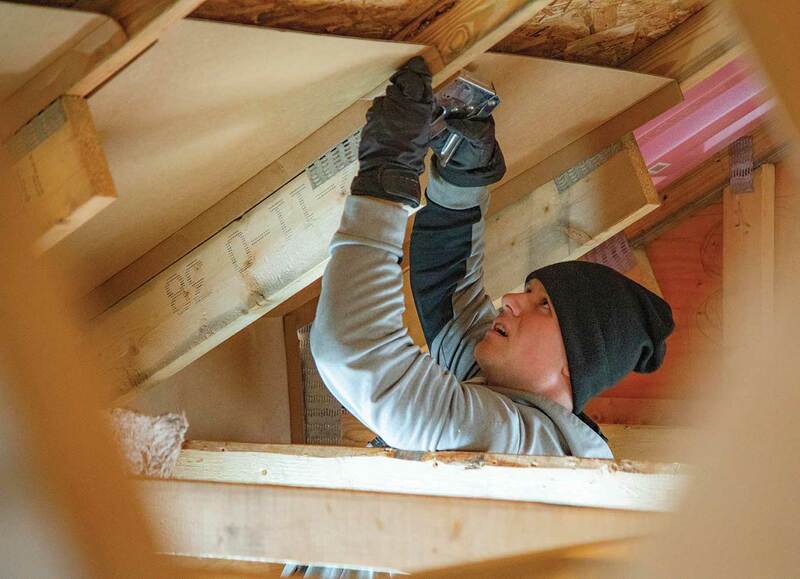 Adam Sobeck, Gaylord High School student, gains college credit and technical experience working on the home’s roof. Otsego County Habitat for Humanity’s home builds and programs help families realize their home-ownership dreams, as well as help build financial equity, self-esteem and self-reliance. Visit otsegohabitat.org to learn more about how you can help the Otsego County Habitat for Humanity. Live outside of Otsego County? Visit gtlakes.com/yourpower to learn about additional ways Great Lakes Energy members can make an impact in their community.